Frazzled and overwhelmed with your financial fears and struggles? 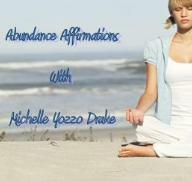 Let go and attract abundance by practicing daily affirmations with Michelle Yozzo Drake. This 11 minute audio cd will help you remain focused and balanced. Each audio package features live broadcast recordings of Michelle Yozzo Drake's popular radio shows "The Time Is NOW: Business Solutions with Michelle Y. Drake" and "Workplace Wisdom with Michelle Yozzo Drake." Is fear keeping you from changing your life? Are your relationships, kids, and career spinning out of control? Does it seem like you never have time for yourself? If you're nodding your head then it's time to take back control of your life! Learn to laugh in the face of fear, bulldoze your way through obstacles, and attain the life you dream of with Michelle's insights into grabbing life by the reins, honing your skills and finding peace, balance and success. Are you a "velvet hammer?" Do you know how to communicate firmly but with a soft touch? Michelle is a master at communicating with power while balancing brutal honesty with compassion and caring, and this skill has rocketed her to the top of the executive coaching industry. You've got a message; now you can learn how to communicate it clearly and concisely to gain success in any situation! Author of "Rich Woman: A Book on Investing for Women"
Spice up your financial porfolio and say good-bye to boring savings accounts! Savvy investor and successful author Kim Kiyosaki reveals her keys to financial independence and offers invaluable advice on overcoming risk aversion tendencies to make your money work for you. Discover the wildly popular school of thought sweeping the nation. Turn on "Oprah," open the newspaper, click onto the Internet and you'll find that everyone is talking about The Abundance Mindset: how the power of your mind can help you get everything you've ever desired! Michelle draws on her own experiences to explain the "laws of attraction," the philosophy behind "The Secret" and how these ideas - coupled with your commitment to overcoming the fear that's holding you back - can open you to a world of success, happiness and satisfaction!